Diving is probably one of the easiest things you can arrange in the Florida Keys. It’s certainly not hard to find your nearest shop that specialise in this activity. From the moment you hit the overseas Highway and start working your away across the diving capital of Key Largo you will start to see large red and white diver down signs. It becomes a bit of game spotting the next one. It certainly keeps my kids entertained. 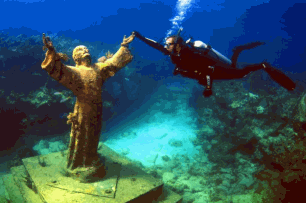 There over 100 places that you can go to start your underwater experiences in the Florida Keys. All of them of course provide a similar service. They take you safely under the surface and show you the best the keys can offer. So quite often you will get taken to the same places. After all what do you want to see, some fantastic shipwreck resting on the bottom, or a load of sand?? You may find a resident expert and think to yourself "This is the man.... I'm not going anywhere else!" We would say good for you, but be a little more adventurous. As each of the dive shops will have a distinct identity all of their own. They do things in a different way, which is charming to say the least. And that’s what makes diving in the Florida Keys so appealing. It's different each time you strap your breathing apparatus on your back. So whether you are an experienced diver, a complete novice or just someone who wants to start off be snorkelling along the top of the surface, we will try to give you the best information on what’s available to make sure your vacation goes swimmingly ! Before we get down to the nitty gritty, and start discussing how much it will cost get into the water, lets tell you the location fo some of the best dive sites that will get your diving taste buds drooling. Of course with Key Largo being the "Diving Capital of the World" we will have more than a few sites around the Upper Keys, but why stop there? As all the way down the Florida Keys there are great natural reefs, artificial reefs, shipwrecks, and just general wired stuff that has ended up at the bottom of the ocean and is worth going down under the waves to take a look at. This is quite a good idea, as you may decide that you do not need to transport your own equipment and just hire what you need when you need it. Dive rates are usually based on a two tank, two site dive adventures. If you don't have your own equipment what you will normally get when hiring is two tanks, weight belt, regulator, octopus breathing device, gauges and sometimes even the mask and the flippers too. Do note though that although the waters around the Florida Keys are perfect for participating in this activity, in the winters you may need a wetsuit. I'll leave it you to you to decide. The majority of the centers that we recommend can offer additional packages for either several days at a time, or with hotel accommodation thrown in. These are a good idea and can be quite cost effective, but it does mean that you will be going down with the same center each time. If that thought doesn't bother you, then certainly check these out when booking. The beauty of being in the Florida Keys is you can try having one of our adventures and decide actually, you can't get the theme music to "JAWS" out of your head, and the past-time isn't for you. Well, most of the dive centers that we list offer the chance for a one day course to see if you like it or not. They can cater for absolute beginners up to experienced divers who just need a refresher before setting out on their own. These course are based on two or more people taking part, so you may well get grouped with people who start the day as strangers and then finish as friends. However if the thought of squeezing your body into a wetsuit in front of people you don't know fills you with dread as you know that you wont look your best, you can pay for private tuition but of course that will cost considerably more. More often or not the centers that we list offer a wide selection of Professional Association Of Diving Instructors (PADI), National Association of Underwater Instructors (NAUI), and other advanced classes. Can't I Just Get In The Water Myself? To be able to dive the waters around the Keys you will have to show your certification card and logbook, and must always wear a buoyancy compensator and submersible pressure gauge. Please note that if you want to go down deep, lets say deeper than 60 feet, you must be the holder of an advanced certificate and logbook showing clearly that you have made dives to that depth within the last six months. If you can't provide this information, you can still go down but you will need to go down with an instructor, so once again as you go down the price goes up. Whilst your under the water you will have to use and share an octopus (an emergency breathing device) and carry a depth gauge and a timer. Really although the waters are extremely safe, you can't be too safe. So use the links at the top of the page as we try our best to give you the low down on the best diving centers in the Florida Keys.